If you wish to set up a private Git server for your personal, work, or team projects, but favor free software and simple architecture, or don’t want a service hosted by a third party, then Gitolite is the solution for you. This article was published in the June 2018 issue of php[architect] magazine. You can see how it looks as part of the magazine in the subscription options to become one today. We have digital and print options starting at $4.99 per month. This article was published in the June 2018 issue of php[architect] magazine. See how it looks in the published magazine by downloading the Free Article PDF. Designed in 2005 by Linus Torvalds for the needs of the Linux Kernel development team, the Git source code management system has become widely accepted outside the community. For more info check out A Short History of Git. 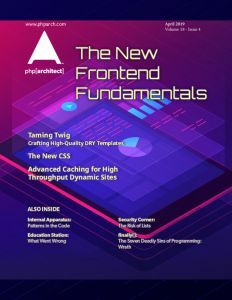 Free, fast, distributed, feature-rich, and yet simple to use, it has become almost indispensable today for storing, comparing, and collaborating on all types of programming projects, and even for other kinds of documents. Although Git can be used primarily locally, its power comes from its faculties of collaborative and distributed work. A repository server is therefore central to any development project with Git as a versioning system. There are several SaaS offerings, among which is the famous GitHub, for hosting public or private Git repositories. In general, they provide services which go far beyond the versioning of the code: they range from project planning to ticket tracking, discussion forums, and even CDN for the distribution of binaries. But some organizations prefer to move towards solutions where they retain complete control over information ownership, network topology, and administration. Free solutions are not lacking to self-host a Git repository service similar to GitHub. Among the most popular tools we can list the GitLab project in Ruby, GitPrep developed in Perl, or Gogs in the Go language. Companies offer SaaS packages based on this software, but the real asset of these projects is they are free and installable on private servers. Nevertheless, an organization that already has its tools for bugs management, project planning, and collaborative documentation may wish to simply equip itself with an internal Git server that only fulfills this function. We will present in this article the Gitolite software, which exists solely to host and control one’s Git repositories on premise. Gitolite, proposed by Sitaram Chamarty, is a collection of Perl scripts, wisely arranged to allow easy management of Git repositories served over the SSH protocol. The tool is designed to solve one problem, and it solves it well. Roughly, a Git repository is nothing more than a .git directory containing files in a particular format, which represent the entire history of changes, in all the branches. The working copy of the repository is simply a view on a given commit hash, which materializes the reconstruction of each source file as the incremental resultant of all the changes up to this level of commit. A bare clone is a clone without a materialized working copy. By its distributed nature, when one makes a git clone of a repository, its entire history is fetched. Thus, each clone is itself an integral repository, and there is an equivalence of roles between the two, hence the choice of the term clone. A more in-depth study of Git’s guts will bring some nuance to the above assertion, as there are more subtleties such as the configuration, reflogs, and hooks, but at first glance, we can keep this model. Permissions support, pull requests management, tickets system, and other Wiki, although highly integrated with the GitHub platform, are satellite services outside the Git repository itself. Free products such as GitLab, which also include these modules, are therefore generally based on at least an HTTP server, a database engine, or a queue manager. The approach chosen by Gitolite is to offer control of an SSH key-based authentication layer, on top of the file system where the Git repositories are stored. The authentication is thus natively ensured by SSH, and the permissions are managed by Gitolite at repository level: the users are not Linux accounts on the server, but virtual users materialized by their public key, as we will see below. So there is no web-based editor, no pull request tracking, or discussion thread on a commit; but there is also no database or application server! Repositories are simple folders on the server, and SSH transports the client Git protocol; it’s simple, secure, and lightweight. At the time of writing this article, the version of Gitolite is 3.6.7. We start from a Debian Jessie or Stretch, whose hostname we assume is gitserver. Note: You may also try the installation on a Docker container. You should use the corbinu/ssh-server image because Gitolite is essentially based on an SSH server, which in itself requires quite some work to assemble in Docker. Alternately, the jgiannuzzi/gitolite image is ready with Gitolite installed, and you could jump to the Configuration section. Gitolite only allows key authentication, excluding any password. Store the private key carefully, as it is required to perform any administrative tasks on Gitolite, such as managing the repositories, or the user accounts. However, even if you lose it, there is a workaround explained below. Let’s connect to the server. The installation of packages is to be executed as root (or with sudo). Let’s create the git technical user in a non-interactive way, without any identity information thanks to the --gecos "" option, and with the password login method disabled. The Git repositories will be stored in the Home folder of the git user (which defaults to /home/git). Note that if you want the files of this technical user (and therefore all the repositories) to be hosted elsewhere, you can specify the --home DIR option to the adduser command. Then, continuing on the server, we take the identity of git for the preparation of the Gitolite service. The gitolite/install script prepares the executables (which are actually Perl scripts) for managing the repositories. Once in place, the bin/gitolite setup script prepares the file structure your meta-repository will use. This is entirely normal, as indicated in the warning. The installation script prepared two repositories: gitolite-admin and testing. The latter will give us the opportunity to validate our setup, which we do in the next section. The former is Gitolite’s meta-repository through which the tool exposes its administration capabilities, as explained below. drwxr-xr-x 7 git  git  4096 Jan  7 08:19 .
drwxr-xr-x 3 root root 4096 Jan  7 08:16 ..
That’s all! At this stage, your gitserver machine is already able to serve the testing repository shipped with the installer. Let’s go back to the workstation. The workstation contacted successfully the gitserver server over SSH by means of your private key. The testing repository is empty but its successful cloning is enough to validate the efforts above. Once the server is up and running, it is entirely managed through the special repository gitolite-admin, which is owned by the administrator. That is to say, the user who owns the private key coresponding to the admin public key, as detailed earlier, is solely entitled to push changes into it. In this repository, the master branch is the one to which Gitolite relates to establish the currently active configuration, at any time. Before we can create new repositories or declare users, we need to clone gitolite-admin on the workstation. Listed in the gitolite.conf file are all the repositories of the Gitolite instance and their permissions. The keydir folder contains the public keys of all the virtual users. We will look at its structure later. Because gitolite-admin is in itself a cloned repository, any modification must be git push-ed back to the server (preceded by the appropriate git add and git commit commands) to update the effective configuration. When you push, the Gitolite scripts automatically create the repository on the server. A Gitolite user is an identifier declared in gitolite.conf as explained above. Authentication relies on the pair of keys of each user: the public keys must be stored (commit, push!) in the keydir folder of the gitolite-admin repository. At a minimum, you will find there the admin.pub key supplied during the install. The files must have a .pub extension and the file names correspond to the username for the Git repositories. Gitolite accepts more than one public key for the same user, to allow for connecting from several machines. Since a user corresponds to the name of a public key file, all the public keys of a given user must have the same file name below keydir. Fortunately, Gitolite lets you use any subfolder structure that may help you organize your keys. In the example above, we created one folder per host, in which different keys might have the same name. This choice does not prevent you from keeping key files at the top level of keydir. Upon incoming connection, Gitolite tries to resolve the username according to the SSH private key, by running through the keydir folder recursively until it finds a matching public key. The private key the underlying SSH protocol uses is indeed that of the user running the command. It is the one which Gitolite matches in order to determine the applicative account. The user git is, therefore, the one through which everything happens, thanks to SSH. Gitolite performs its tasks thanks to its own limited, custom shell. The authorized_keys file of use git is maintained by Gitolite automatically every time a push occurs in the gitolite-admin repository, as per the new updates in the keydir folder. would be somewhat dangerous, and might lead to corrupted data. In practice, if the Git server is active (push) during the tar operation, the special files which represent the repository’s history would be captured in an inconsistent state. One solution could consist of temporarily stopping the SSH service on the Gitolite machine, just long enough to perform the tar command, to guarantee that no remote user is modifying the repository’s state during the archiving. But this is not optimal and would lead to a poor user experience, especially if you manage many repositories and schedule a lot of backups. A better approach would be to make a local clone of the repository on the server from the local path of the origin folder and then to archive this copy. The --mirror clone is also a bare one, which means that it does not ship a working copy. The replica has some differences with the original (in particular the hooks are lost, as mentioned above) but if the backup is mainly aiming at putting aside the source files and their history in a safe place; this method is the preferred one. The hooks are script files located directly in the /home/git/repositories/mon-depot/hooks folder on the Gitolite server: it is safe to archive them as regular files. Besides, an administrator should maintain them as source files on their own, with their dedicated Git repository (with scheduled backups). Let’s address some of the most frequent situations. Then you just need to configure the Locale environment parameters on gitserver. As root, add the following lines to file /etc/environment (or create it if needed). If you ever lose your admin private key, don’t panic. Everything remains possible without it (as long as you’re able to connect to the server with SSH, of course). All you have to do is log in to the server’s shell, clone locally the administrative meta-repository, and declare there your new admin key. So, first, let’s generate a new key on the working station, and upload it to the server. gitserver# git commit -m "Not wise to lose the admin key"
Notice the final Gitolite push command instead of a regular Git push! In effect, the Gitolite executable, on the server, allows bypassing the checks (hooks) during the push, which is necessary when the remote is, in fact, a local file-system path. This operation leads to updating the authorized_keys file of the real git user, and you become able to get remote control over gitolite-admin. This problem is not directly related to Gitolite, but since it is very common, it is worth mentioning in this article. How can you instruct Git that it should use one particular key of yours among your very heavy keyring, when it comes to connecting to Git server? will use your default private key (generally the file ~/.ssh/id_rsa). There are several problems here; what if the Gitolite key for my virtual user is a different file? What if I need to act as two different virtual users from the same workstation and same system account? Finally, how do I simplify the command and avoid writing the « git@ » part every time? This snippet specifies the fully qualified hostname of our Git server nickname (if needed), and which remote username should be used by default for any SSH connection (so as to avoid typing « git@ »), and the private key to communicate. It will know you want to connect with your admin user and key there. Notice that this trick can be used with GitHub as well, if you need to work on many repositories with a unique Deploy Key for each one. Git hooks are events that the versioning system triggers upon various situations, in particular when you commit your changes. Git lets us write our own event hook handlers, in the shape of executable scripts that we put into the .git/hooks directory under any repository. Each hook has a fixed, pre-defined name, and if we want to activate a script every time a commit occurs, to perform some checks and accept or reject the commit, all we have to do is write an executable by the name pre-commit inside the hooks folder. However, git commit is a local operation; your computer does not communicate with the origin repository yet. The pre-commit hook is a local script you can share with your friends but it does not belong to the repository—and you definitely won’t persist it in the remote bank. It is easy to install (locally) a suite of pre-commit checks for PHP projects, in order to validate the syntax, the respect of standards or to execute automatically the unit tests for example. You may find the bruli/php-git-hooks package useful for that purpose. The local suite will do its job whether you use Gitolite or GitHub, because it only runs on your computer, without the server being aware of it. There is another domain of events, which are triggered on the server upon network activity. The main usage is to decide whether to accept or reject a git push. The corresponding hook is called update. In Gitolite we can configure arbitrary scripts to be wired to this hook, at the repository level, in the following steps. Create a directory called server-hooks under /home/git. Edit the /home/git/.gitolite.rc file, and just inside the %RC section, add the following directive. Put your scripts in the server-hooks folder, with any name that suit your needs. The above snippet declares the execution of the check-code-quality script, followed by the run-phpunit script in this order. Each script, by the same name, must be an executable file under your server-hooks folder. They act as filters: the system calls them with the base hash and target hash as the second and third argument—and they may return a non-zero exit code to reject the push altogether. Gitolite lets you conveniently organize your scripts atomically, and attach the relevant ones to the repositories of your choice, possibly in a different sequence for each. In the following example, we’ll see an example of a check-code-quality Bash script you could install to have Gitolite check the PHP files impacted by a pThe next listing is an example of a check-code-quality Bash script you could install to have Gitolite check the PHP files impacted by a Push operation. Let’s see in Listing 1 an example of a check-code-quality Bash script that you could install to have Gitolite check the PHP files impacted by a Push operation. # before we can run analysis tools. # exit with an error status (reject the Push) at first probem. We only saw an overview of the capabilities of the tool, which offers very rich options in particular in the area of the permissions and rules at the refs level (conditions on the number of files in a push, control and authorization on specific files, working hours and more). Besides, the program is extensible via a collection of “non-core” scripts you can activate, (for specific needs such as the support for HTTP, LDAP, replicas for high availability, or the integration with external ticket systems), which make the solution extremely flexible without compromising on security or privacy.